With Jesus’ help, Joseph was able to support his growing family with his modest carpentry business. His open air shop occupied the addition to the west side of the family home. Two large work tables stood in the center of the room. The baked mud floor was covered in wood shavings and sawdust. The precious tools of Joseph’s trade, handed down through several generations of his family, hung from the huge cypress beams that supported the ceiling. Clay jars containing oils and paints lined the shelves along the inner wall. Jesus sat on a tall stool at one table, sanding the boards that would complete a beautiful wedding trunk for Joseph’s friends, Eli and Miriam. Joseph was preparing the iron hinges for the trunk. “How are you coming with that sanding, son?” Joseph asked over his shoulder. “I can smell supper cooking. My stomach is rumbling.” Jesus said, sniffing the air. Jesus and Joseph finished washing and went inside. Jesus went about lighting the oil lamps. Joseph put an arm around each of his daughters. “Look at this feast. My daughters are becoming fine cooks. I will come and eat as soon as I see your mother for a few minutes.” Joseph pushed aside the sleeping room curtain and went to Mary. “I am well, my love. You’re in an especially good mood. The trunk must be finished.” Mary said. “Between our good fortune to have friends who need a trunk for their wedding, a customer who pays us with fresh lamb, and a son who is showing a definite talent for wood carving, I would say this is a grand and glorious day. Yahweh be praised!” Joseph said, scooping up baby James. “This little man must come out and get his first smell of lamb. I will have one of the girls bring your supper in to you shortly. Get a few winks of sleep while you can.” Mary smiled, closing her eyes as she slid leisurely down under the bedclothes. “You, a midwife, Papa?” she exclaimed. Joseph lifted his hands toward heaven and praised Yahweh for their blessings and for the bounty of their table. Then they all dug in with gusto. “All right, Mary. I will. Tomorrow I am taking him with me to Eli’s to deliver the trunk. Joseph kissed his wife and James, put out the oil lamps and climbed the steps to the roof. The sky was as clear as he had seen it in weeks. There was a slight breeze. Joseph spread out a blanket and lay on his back with his hands beneath his head. Millions of stars twinkled in the black sky. It was as if he were staring into the very eyes of Yahweh. Suddenly, he thought he heard a soft voice on the breeze. He sat up and peered into the darkness. There, on the opposite side of the roof, Jesus was kneeling and searching the same vast sky. Jesus answered softly. Joseph moved his blanket over beside Jesus and sat down. So Joseph wrapped the cloak around the two of them and began the story of that blessed night. “It was late in the day when our caravan arrived on the outskirts of Bethlehem. We had been traveling for over eighty long miles. I knew that Mary, your mother, was extremely uncomfortable, but she never complained. Some mornings she could hardly rise. I was glad we had the donkey but in her condition it couldn’t have been easy to balance on his back along with our packs. She didn’t think I saw her, but every so often during the two days before we arrived, I saw her face draw up in pain. My heart froze as I realized she must be very close to her time. When the houses of Bethlehem appeared on the horizon, I heaved a sigh of relief. Finally I would be able to offer her a warm room and a real bed to lie on. But it wasn’t long before I realized that there were far more people in Bethlehem that day than the town’s inns could possibly accommodate. A group from our caravan had decided to keep going to the next village to find lodging, but I knew we couldn’t take that chance. We wove in and out through the crowd asking about rooms. By sundown, I had inquired at every available inn with no luck. Mary had begun to groan and hold her belly. Her eyes told me there wasn’t much time to waste. How could I ask her to labor on a dusty blanket on the ground? It is a husband’s duty to protect his wife. I had to find my wife a midwife and some privacy at the very least. When we arrived at the very last inn on the edge of town, I was desperate! “Was there no one who offered to help you, Papa?” Jesus asked. I thanked him and reached for my money purse, but he said he could not accept money for the stable. I went outside to Mary with mixed emotions – I was so grateful and relieved and yet scared to death. `Mary, we have a place to go. Let me help you up. It’s not far.’ I didn’t have the courage to tell her I was carrying her to a stable full of cattle, donkeys, and sheep. The innkeeper’s wife led us down the path ,while a servant boy ran ahead an swept out a few empty stalls, filling them with fresh hay. I’ll never forget what your mother said when we got there. “Oh Joseph. It’s such a cozy stable. Maybe they would let us stay here.” I laughed and cried, all at the same time! Your mother said, “Joseph. Fetch me plenty of water and hurry.” This was one time I didn’t ask questions. I ran to find a well. It felt like I had to run all the way to Jerusalem! When I returned, I there was no sound coming from the stable. Terror gripped me.Then I heard a newborn’s cry. It was you, Jesus. Your mother had delivered you by herself! She looked up at me with the most radiant smile I had ever seen. `The son of God could not wait,’ she said. `But we would like you to cut the cord.’ Then she laughed! Can you imagine? I knew then why God had chosen this young girl to be the mother of the Messiah. So I cut the cord. It wasn’t hard, but my hands shook helplessly. Just then the innkeeper’s wife returned. I went outside and sank down onto the ground. `El Shaddai, our all sufficient Lord, I praise You. You are Yahweh Jireh, the God who provides. You are Yahweh Raah, the God that protects. Thank you for the birth of our Messiah! Give me wisdom and strength to care for this precious gift You placed in our care. I am nothing but a lowly carpenter. How shall I raise a king? Help us both, Lord! Help us to teach and provide for Your son.’ I guess I had been too frantic to notice before, but at that moment, I noticed the light. It was so strange. It was after midnight and yet for the last few hours it had been bright as day! Over our heads shone the brightest star I had ever seen. Now I don’t pretend to know anything about the movement of the heavens, like the Rabbi does, but I knew I had not seen this star before. I couldn’t stop staring at it. It was as though it was our own private light, standing over Bethlehem that night to let the world know God’s son had been born. It was a though your birth was bringing light to a dark world. “Well, I looked around until I spotted the manger that the cattle fed from. I got an idea. If I were to put some soft hay in that trough, it would make do for a cradle. Once again I had to apologize to your mother. I’m sure when she’d dreamed of her firstborn child, she hadn’t pictured him in a feed trough. But you know what? You didn’t seem to mind a bit. I laid you in there, covered you with my wool shirt, and you slept just fine. We all did – despite that bright starlight. Jesus’ face shone as he gazed into the heavens. “Oooooh. I knew it,” he whispered. I hope some of you have read the interview column, 10 Questions, with Garrison Keillor in a recent Time magazine. I am a particular fan of his. I know at exactly what time every Saturday night he will begin his stories about Lake Wobegon on the Prairie Home Companion radio show. I am a big fan of great oral storytelling in general. A lot of people think it is a lost art. I disagree. I think that if you ask almost anyone who in their family loves to tell a good story, they will be able to name him or her without hesitation. In the hands (or mouth, rather) of a skilled storyteller - and most come by those skills naturally - any ordinary event becomes a story that has the folks in the room eating out of his or her hand. My father tells great stories and so does my best friend’s husband. I’d like to think I do too, although I’m not ready to take my show on the road. I do know enough to appreciate the truth of what Mr. Keillor (who does take his show on the road) has to say about telling stories. He was also asked how he managed to master both writing and oral storytelling. He answered quite humbly but in truth, “I didn’t. There’s no mastery to be had. You love the attempt. You don’t master a story any more than you master a river. You feel lucky to canoe down it.” Whenever I get to tell a story, either orally or on paper, it is such a kick! That doesn’t mean it’s easy. It means it is fun and fulfilling and if you have an audience that appreciates it, all the better. I feel “lucky to canoe it”. The weakest part of my writing has always been the ending. I usually have a hard time recognizing it when I’ve gone past it, and I certainly agonize over a proper ending - one that isn’t pat or patronizing to the reader. I just love what Garrison said about that. He was asked how he came up with the catchphrase “Where all the women are strong, all the men are good-looking and all the children are above average”. This was his answer: “I needed to solve the problem of any writer telling a story — how do you end it? You can do a gentle fadeaway: `He went to the window and looked out into the darkness. Snow was falling gently through the spruce trees.’ But that’s not good for half of the year. If you just pause and say, `That’s the news from lake Wobegon, where all the women are strong, all the men are good-looking, and all the children are above average,’ the problem is solved.” Now why didn’t I think of that? The above photos are taken from the website www.nazarethvillage.com . Nazareth Village is an archeologically authentic reconstruction of a village in modern day Nazareth that visitors can tour to see what the Nazareth of Mary and Joseph’s time was like. 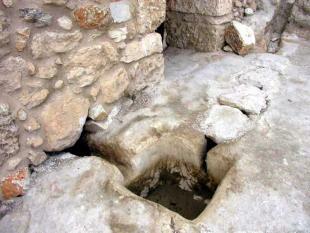 The architects built each building according to archeologically accurate plans with original materials. 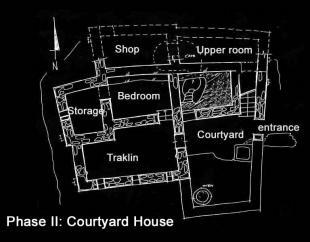 They also used the plans of structures that remain or are still built today with the original tools and materials from the 1st century B.C. 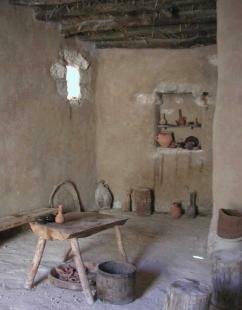 I included these photos to enlighten the reader of my story, which begins in the Nazareth of that time. Things were cramped in Mary’s family home in the small village of Nazareth, especially since she, Joseph, and their son, Jesus, had moved back to join Mary’s mother and sisters nine years ago. 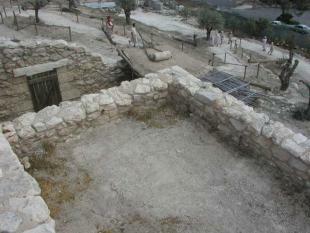 Like all the others in Nazareth, Mary’s grandfather had built his house into the side of a steep hill, facing south. He had chosen to build on this site because of the bell-shaped depression in the rock, which was an ideal spot to dig a cistern. Once the vital source of water was established, he erected the house from the plentiful limestone in the hills surrounding Nazareth, with straw and clay for mortar that kept out the cold and insects. Under the roof, made from cypress beams, woven- cane mats and many layers of earthen plaster, were the work room, three tiny sleeping rooms, and a cool, dark cave, hewn into the rock for food storage. The attached, outdoor courtyard was surrounded by stone walls that housed the stone gutters, which channeled rainwater from the sloped roof down to the cistern in the center of the courtyard. 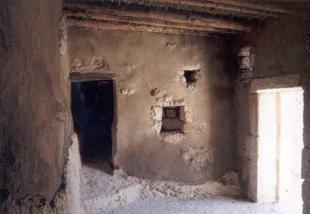 Small, narrow openings high in the walls let daylight into the eastern and southern sides of the house, while attached to the western wall, was the carpenter shop Joseph had built when he joined the family. Today the cramped household was even more so since Mary had just brought baby James into the world. A new baby always sets a household topsy-turvy. Mary and the baby were resting in their small sleeping room, Joseph had escaped to his shop, Mary’s mother was making bread in the outdoor oven, Jesus’ two sisters were hanging laundry to dry on the roof, and Jesus was hanging around outside his mother’s room, hoping to finally be allowed to go in and see how she was. He had always been protective of Mary and childbirth was a dangerous ordeal for women. Jesus lifted the heavy clay jar and poured a bowlful for his baby brother’s bath. It seemed more than only two days ago that all the men of the household had been sent away while the midwife, his aunts, and Grandmother of course, had helped his mother through the labor and delivery of this baby. Such comings and goings, fussing and chattering! And then there’d been rejoicing over the birth of another son for Mary and Joseph. Tomorrow the house would be buzzing even more with preparations for James’ circumcision at the synagogue on the eighth day, but now Jesus was only interested in seeing his mother. Besides, nobody seemed to notice him anyway. Just baby, baby, baby. “Mother, may I come in?” Jesus called through the curtain that separated his parents’ sleeping room from the rest of the house. “Yes, Jesus, come in. Come in and see your baby brother!” Jesus pulled aside the curtain and walked to his mother’s bedside. It was nice and cool in the room with just a few rays of sunlight filtering through the narrow window. She lay propped up with the tiny infant beside her. Jesus kissed her gently on the cheek, then leaned over to get a look at James. Jesus curled up at Mary’s feet. “I can take care of Mother,” he said proudly. “Now, Mother? Tell me now?” Jesus said, his eyes dancing in anticipation. I tried to explain that I was still a virgin, but he answered, `The Holy Spirit will come upon you and the power of the Most High will overshadow you. So the holy one to be born will be called the Son of God.‘ Then the angel mentioned my cousin, Elizabeth. “No, not right away. I decided to wait until later. I told them about Elizabeth, though. They did not believe me. The year before, Elizabeth had told me that I was welcome to come for a visit any time. I thought this was a perfect time! I asked if I could go as soon as there was another group going that way with whom I could travel. At last they agreed. The next week I joined a family going that way and joined them on their journey. I was excited. Maybe Elizabeth was pregnant. If she was, would she believe me? “So what happened at Aunt Elizabeth’s?” Jesus asked. “That’s right. Yahweh gave Moses the laws about Nazarites. I believe that one day you will meet John for a special purpose, for he will be the one to announce the arrival of the Messiah.” Mary closed her eyes and squeezed Jesus’ hand. “Jesus, Joseph is such an honorable, gentle, loving man. He told my father that he would not press public charges, but he would grant me a quiet divorce. I cried out to Yahweh for days. Lord, please make Joseph understand! I never left the house.” Mary changed her position in the bed to get more comfortable. “The very same angel I had seen appeared to him in his dream. The angel told him that he shouldn’t be afraid to marry me because I truly was carrying a child by the Holy Spirit. Yahweh had answered my prayers. But our happiness did not last long. “The troubles that Grandma talked about?” Jesus asked. OK, so I’m a big kid when it comes to snow. I admit it. I love snow (except after St. Patrick’s Day). Wednesday the blizzard moved in dropping 12-14 inches of snow. The superintendant of schools actually called a snow day! That’s because it’s still early and everybody wants time to get their cookies baked or wrap packages or build a snowman. After Christmas snow days are rare. It has to be 30 below zero or an ice storm to call off school. Teachers would rather push through 2 feet of drifting snow to get to work than have to tack on extra make-up days in June! No, snow doesn’t slow us down. In Wisconsin we’re prepared for it. We have snowblowers, efficient plowing, snowmobiles, and we’ve even been known to cross country ski to work if necessary! Visitors from out of state are amazed how the cold doesn’t phase us much either. As someone from Scotland said - There is no such thing as bad weather - only bad clothing. We choose our winter outerwear carefully. It has to be warm up to -30 degrees. It has to be stylish since it is all most people see us in from November to May. And it has to have pockets - lots of pockets- for kleenex, mittens, car keys, chapstick, a bottle of Tylenol, cough drops, a pen and paper, our cell phone, sunglasses, hand lotion, and static spray (to keep from getting an electrical shock sliding out of your upolstered seat). One winter my oldest daughter, who was living in Minneapolis, even carried a full size office stapler around in her coat pocket and claimed it came in handy several times! Our sweaters are wool, our gloves are thermal-lined and our boots are warm and comfortable, since they are all we wear most of the winter. And yes, we do wear long underwear under our business suits and even some cocktail dresses. When the temps plunge way below zero, we even have a way to plug in a heater under the hood to warm the engine block of our car (that really impresses outsiders!) and anyone without jumper cables in their trunk, must be a newcomer to snow country. Other than those who drive a truck or a big Bertha SUV, everyone carries a big bag of salt around in their trunk all winter. They don’t ever actually use the salt. It’s in there to weigh the rear end down so they don’t skid on the ice or get blown off the road in the wind. However, lest you think we are all tough when it comes to winter, the best-selling Christmas gifts in our town last year were the gadgets that allow you to start your car with a push for the button from the inside of the nice warm building you’re in. And while you’re bundling up in your fashion-statement down coat, your car is warming up! You’ll find plastic over the windows of a lot of people’s houses. It makes for a shower door-like view but keeps out the drafts and keeps those dreaded heating bills down. There are lots of fireplaces and wood-burning stoves here in the north woods. Each October my husband gets a face cord of wood for our fireplaces and sets the thermostat at 66. I get out the slush rugs. You’d be amazed how much dirty snow melts off the bottom of boots and gets tracked across my beautiful hardwood floor. Of course I’ve laid so many slush rugs that you can’t even see the hardwood floor, but it beats vacuuming and wiping up floors twice a day. We had a warm November this year and folks took advantage of it by putting out their Christmas lights and yard decorations as soon as Halloween was over. We should have. My husband was outside, up to his knees in snow, on Thursday, stringing lights along the fence and garland around the lamp posts. But he survived just fine because - you guessed it - he was wearing the right clothes. So now we’re off to cut our Christmas tree at one of the dozen Christmas tree farms here. The ritual is that mom, dad and the kiddies split up and tramp up and down the rows of ten acres of balsam, scotch pine, spruce, and white pine. When one of the kids spots a tree he or she thinks mom will like, they shout out and stand on that spot on his or her soon-to-be frostbitten toes while mom tries to find him. If he is lucky, she’ll love it, dad will cut it down and drag it to the car, and they’ll be on their way. But mom is really particular. She holds out for a better one and the kids each go find another potential tree. Eventually mom makes a decision - mainly because she doesn’t want to spend the evening in the emergency room with her frostbitten children. Our five children are grown now and, it might be noted, all have artificial Christmas trees. I hate artificial trees. I love the earthy smell of fresh pine in the house. However, today I compromised. We chose a tree inside the barn and as always, when we got it set up and strung with lights, we had to admit that it was the best tree we ever had. The Christmas season is upon us! 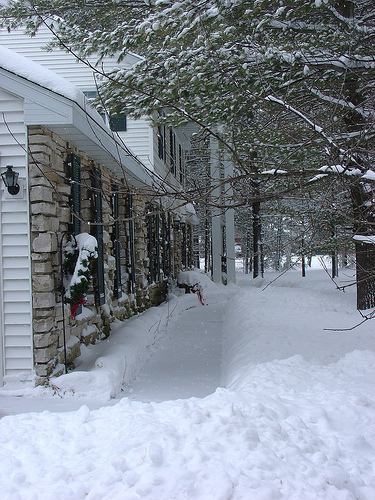 Here in Wisconsin, we got 12 inches of snow on the last 48 hours and I have to admit, it seems more “Christmasy” now. However, snow or not, this is the season to make our hearts ready to welcome our King of Kings. I was privileged to attend the St. Olaf College Christmas Festival last Saturday and the concert of the Vocalessence choral group on Sunday. The music lifted my soul to heaven’s gate! 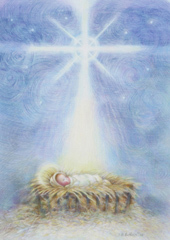 I came home and was inspired to write a Christmas poem entitled “The Christ of Christmas”. I would like to preface it with two lines from one of the pieces I heard done by Vocalessence. They are the last two lines from the lyrics to “The Heart-in-Waiting” by Kevin Crossley-Holland. each seed that’s been sown?